"The complaint-based system doesn’t work. Tenants cannot be expected to have adequate knowledge of the building codes or the legal know-how to hold their landlords accountable. Without requiring rental licensing and mandatory inspections, there is nothing prompting landlords to keep their properties in safe and livable condition." The editorial went on: "The rental licensing issue is a student issue. Knowing the duration of their stay will be brief and lacking a broad range of experiences to draw from, students are likely to grit their teeth and suffer through shoddy rental conditions. We deserve better." Yes, students do deserve better and they are waking up to the fact that they have strength in numbers. Each year around April they take part in a 17,000 unit rental goat rope during which many of the 10,000 student renters play the part of the goat being roped into squalor by the city's landlords for the ensuing academic year. Stephanie Kirk, a student journalist at the Western Front, also wrote this week a separate piece entitled "Students Remain Oblivious to Renter Rights". [Her piece can be found by clicking here]. The article highlights the results of the latest survey of students that demonstrate the shabby conditions under which students live and the often shabby way in which they are treated. By virtue of their numbers and the already established interest groups on campus, students are in an excellent position to organize and to bring pressure on City Hall to create a program that will clean up rentals making them safe and healthy places to live. Councilman Jack Weiss is leading the Planning Committee of the City Council forward in creating an ordinance to ensure the health and safety of all renters in Bellingham. He ought to have our support because he knows very well, too, that that all renters deserve better. Heather Rees, a student at Western Washington University, recently published the results of a survey she created and conducted on student experiences with rentals, living off-campus, safety, parties and community resources. You can read the entire document, entitled Off-Campus Student Life Survey by clicking here. 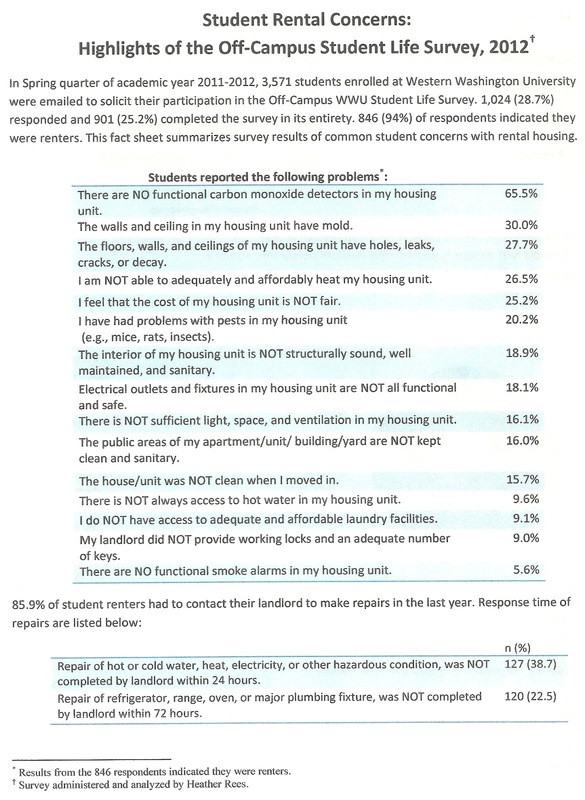 For the purpose of this blog entry, I will confine my comments to that part of the survey in which you will find student experiences with rental housing - more specifically health and safety problems. Almost 10,000 students at WWU rent on the open market in Bellingham where there exists 17,000 +/- rental units. The survey was able to capture data from 1,024 students among 3, 571 who received an email solicitation to participate. That is a response rate of 29%. The 1024 responses also represent about 10% of all students living off campus. These are hefty percentages in survey land. 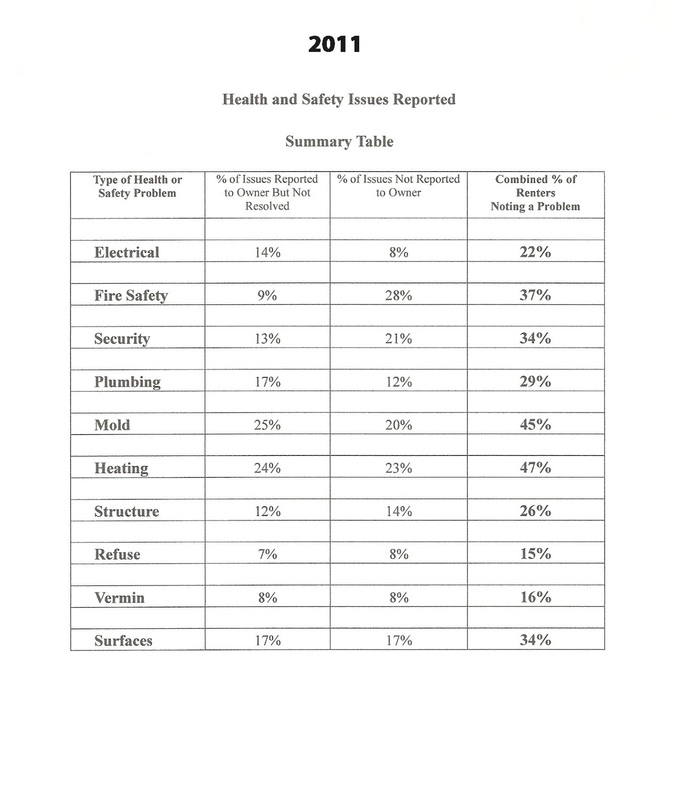 The disturbing factor with respect to these rentals is the percentage of tenants who report health and safety violations in their dwelling unit. To a great degree the results of the Rees survey support the findings of another student survey done in 2011 by the Viking Community Builders and the Western Democrats. You can read my blog entry on that survey by clicking here and following the imbedded links. Click on the image at left for a chart of results of the 2011 survey and compare it with a similar chart taken from the Rees project also pictured on the left below. 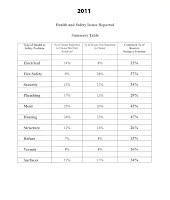 Extrapolating from the percentages of health and safety problems found in the Rees survey and applying them to the number of rental units in Bellingham, one can calculate that nearly 11,000 of the city's rental units (17,000 X 65%) may not yet have the required carbon monoxide alarms. One might expect to find 5,000 units with mold; 4,400 with inadequate heating; 3,400 with vermin, 3,000 with deficient or dangerous electrical components; and about 1,600 with inadequate or simply no hot water at all. Ms. Rees is not the only student who is taking action on the poor state of rentals in Bellingham. The Associated Students (AS) of WWU has been active in getting students to attend the Planning Committee meetings during which rental health and safety is the topic of discussion. With the urging of AS, student leaders and renters have been speaking during the public comment period at city council meetings. Student Rachel Cochran, the coordinator of the AS Legal Information Center, has created a Facebook page entitled the Legal Information Center (click here to see that site). The Center provides student renters with advice on renting and direction for obtaining legal advice. Reading the two studies I mentioned above will provide the WWU administration, the Mayor and the City Council not only with information on the state of our rentals (health and safety) but a student's perspective on the lack of information about their own rights. There is also the exploitation by landlords of that lack of knowledge. Some then line their pockets by not performing maintenance, by refusal to return security deposits, and by threatening to "black list" students who are vocal in their complaints. 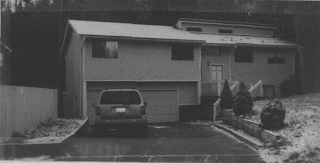 As the Planning Committee of the City Council continues its discussion of licensing rentals and inspecting them for health and safety issues, you can voice your support for legislation that will improve the condition of Bellingham's rental stock. This has to be done soon and before a renter is killed. We have dodged several bullets in that regard over the past two years during which five rentals burned. To refresh your memory you can read about those five fires by clicking here. Write to the Mayor at: klinville@cob.org. Write to City Council members at ccmail@cob.org. Landlords have acted with nearly absolute immunity for decades. It is now time to level the playing field by demanding accountability from the landlords and sanctions if they fail to maintain their rental units. 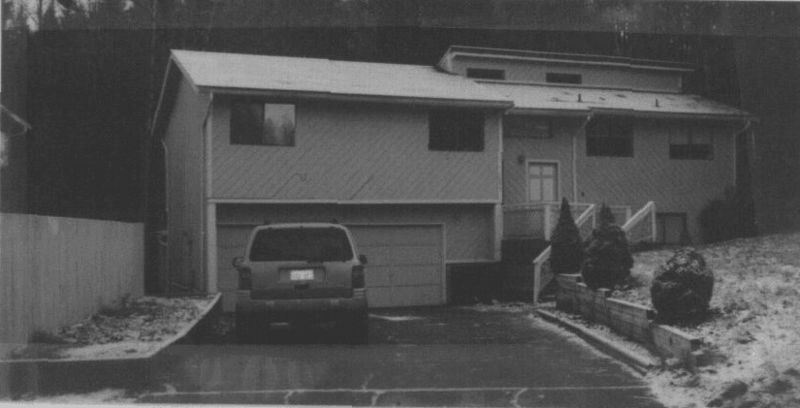 Although this rental is not in Bellingham, it is within the Urban Growth Area which will eventually become part of Bellingham. At that time, rentals in Geneva will become Bellingham's problem. There is a lesson to be learned from this rental fire. (You can read the Bellingham Herald article here.) Chimneys are a source of danger for rentals not only from the possibility of a fire from creosote buildup but also from poor drawing that can spread carbon monoxide throughout the dwelling unit. Leaky chimney linings can also allow material (such as wood and insulation) abutting the chimney to catch fire. With over 25,000 such fires each year, the danger presented by chimney blazes cannot be ignored. Carbon monoxide detectors are now required in rental homes in the state of Washington. It appears that this particular fire was discovered when one of the renters was awakened by a smoke alarm. Mere smoke alarms will not detect carbon monoxide which kills silently while a renter sleeps. Carbon monoxide detectors must also be located low enough to perform correctly as the gas tends to sink towards the floor. Ceiling mounted detectors are not very useful. You can read more about the requirement for carbon monoxide detectors in my 30 Jan 2013 blog entry entitled Carbon Monoxide Alarms Now Required in Rentals. Click here to read that entry. So as the discussion continues on rental health and safety, the City Council should add chimneys to the list of items for the eventual ordinance on rental inspections.